Finally got around to making dumplings.. the wrappers and all. You can use these same wrappers to make potstickers, wontons and what not.. steam them.. fry them, or boil them in soups. And below is another wrapper recipe with some added rice flour and also with Step by step pictures on how to shape them into ShuMai . Heres the some Steamed Bao which I made a couple of times. these are yeasty fluffy buns filled with all kinds of saucy filling.. and also served in Dim sums..
Have a fun Dim Sum! Shu Mai /Siu Mai dumplings filled with broccoli and zucchini in garlic sauce. 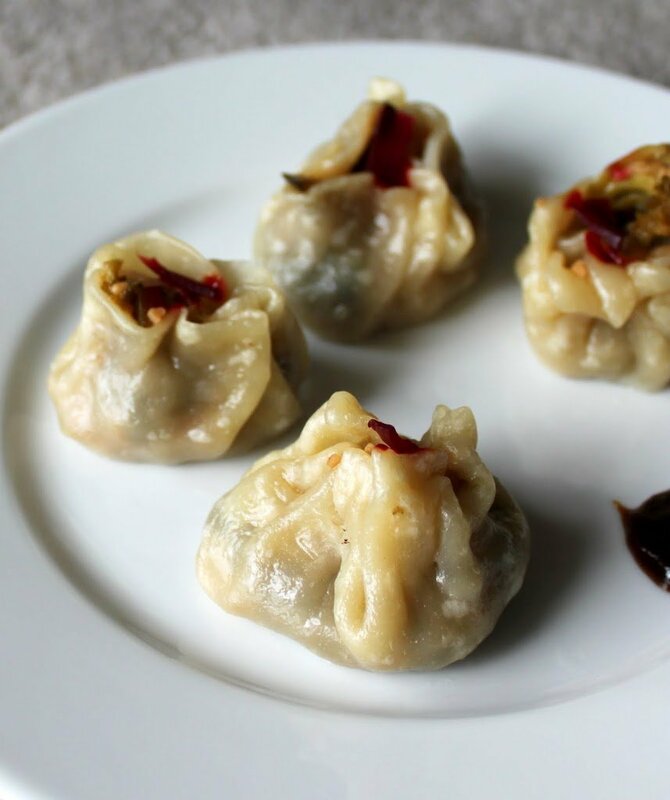 A delicious snack or appetizer, I served these dumplings with beet slices and hoisin sauce. Vegan Recipe. Grease your hand with oil. Add in the warm water a little at a time till the dough starts to come together. Knead for a few minutes till it doesnt stick and is elastic. Let the dough rest covered by a towel for half an hour to an hour. Make small balls and roll them out, or roll out bigger ball and cut square or circle shapes depending on what you want to use the wrappers for. The rolling out takes some effort. Use cornstarch to dust if dough is sticky. The dough is also elastic, so roll it out, let it rest for a few seconds, then lift and roll out more. For the Shumai, I rolled the small balls into circles. To store, dust with cornstarch and store in airtight bag in the refrigerator. In a pan, heat some canola oil and add garlic and chili flakes and cook on medium heat for a few seconds. Add in the broccoli and zucchini, toss and let cook for 3-4 minutes. Add in the hoisin sauce, salt if needed, sugar and sesame oil. Mix and cook covered for another 3-4 minutes. Adjust spice and sauce for taste and let cool. Take a small piece of the dough, make a ball and roll it into a 3-inch circle. Put the wrapper on your thumb and index finger and put some filling in. 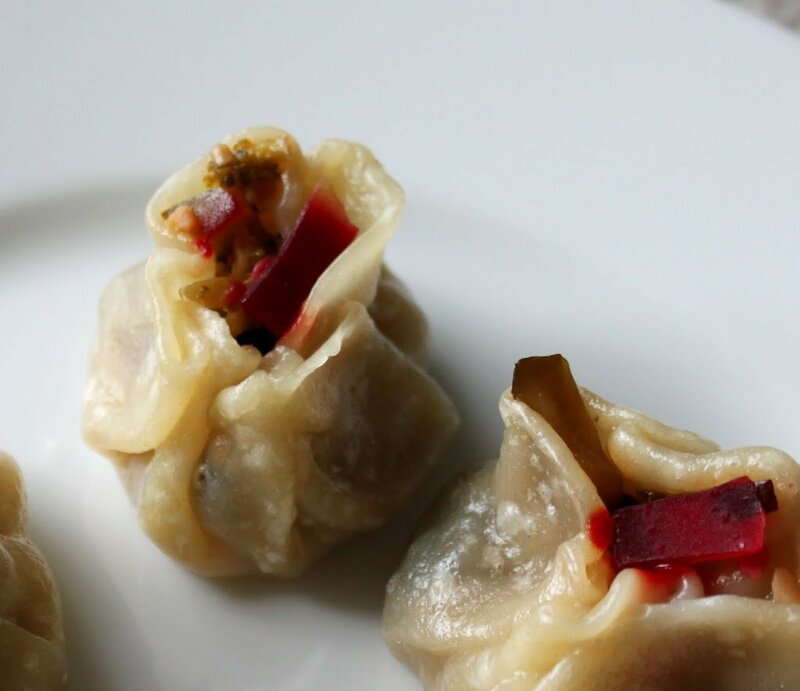 Slowly push down the shu mai into the hole between your thumb and index finger to wrap the wrapper around the filling. Push the edges of the wrapper inward in small folds covering the top edges of the filling like a pouch. Some filling at the top should remain exposed. Use a little water to seal the folds if necessary. 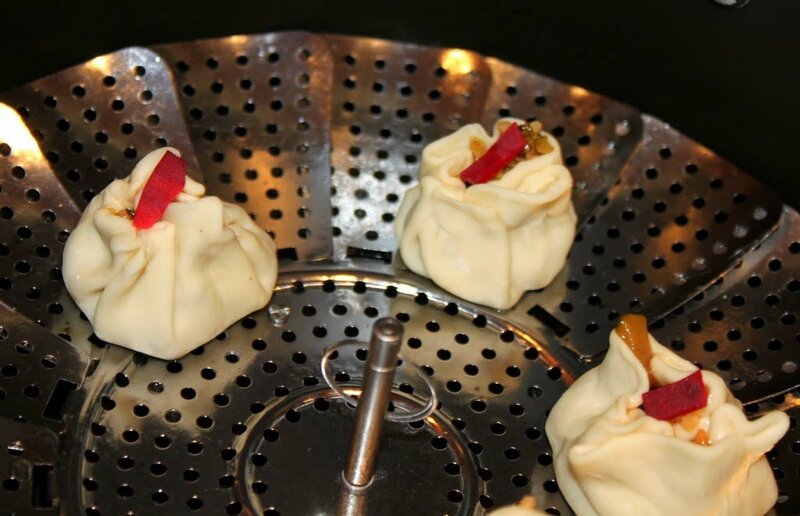 Place shu mai on parchment on bamboo steamer or on greased steel steamer. Steam for 7-10 minutes until the wrapper appears translucent. Serve hot with dipping sauce. I topped it with thin beet slices for garnish and added color! Some Dipping sauce options: Hoisin sauce, sweet and sour sauce, soy sauce, or mix in some chili oil, minced garlic or ginger(not both), soy sauce and rice wine vinegar. Wow… so beautiful.. Can we store this wonton dough for long? Thank for dropping by Krithi. I think you can store the dough like we store the roti dough. I havent tried it though. The rolled out wrappers kept between parchment paper or cornstarch dusting keeps well in the fridge for a couple of days, and frozen for longer. lovely siu mai- nice filling for the dumplings ! Oh yum! I’d definitely buy the premade wrappers (I’m a bit lazy in the kitchen like that), but the filling sounds delicious! Looks delish! Thanks for sharing — your blog is fabulous! One word, “WOW”. I am going to make these next week. Thanks! Thanks Erin and Two Vegan boys! What about a paleo version of the dumpling wrappers? Can you use Coconut flour as a substitute or almond flour? both flours will not hold the dough together because there is no gluten. you can try adding some tapioca and potato starches. These look so good! I will definitely be trying out this recipe soon. 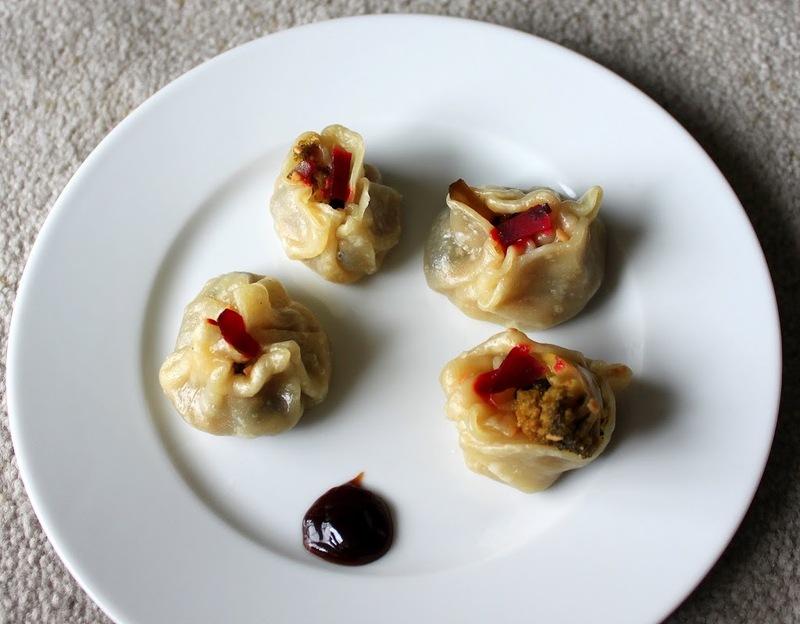 Mmmm, vegan shumai! first. I love your website! I didn’t notice where it said how many the recipe made. How many did this make? Also, do you think the dumplings would store well? I want to use them for a meal prep. 8 to 12 depending on the size and thickness. Yes, you can roll them out and store between parchment in a sealed container. refrigerated for 2 days and frozen for longer.